Reuters news reported yesterday that, “Revival of the $1 a gallon biodiesel tax credit would be part of a jobs and tax bill in the U.S. Senate, according to a draft that circulated on Capitol Hill on Thursday. Yesterday’s article indicated that, “The draft also included a $1.5 billion in disaster aid for farmers and would allow a five-year depreciation schedule for agricultural equipment. DTN Ag Policy Editor Chris Clayton reported yesterday (link requires subscription) that, “Congressmen questioned Agriculture Secretary Tom Vilsack on a broad array of budget proposals Wednesday as USDA officials appeared before the House Appropriations Subcommittee for Agriculture to make their case about budget priorities for the next fiscal year. Jim Snyder reported yesterday at The Hill Online that, “Senate Republicans on Tuesday seized on errors in a United Nations climate change report and the recent ‘Climategate’ e-mail controversy to press the administration to drop its push to regulate greenhouse gas emissions. “Democrats, meanwhile, countered that the overwhelming evidence suggested human activity was causing global warming and compared climate change skeptics to people in the 1930s who refused to believe Nazism was a threat.” (Note: To listen to an audio clip from Sen. Bernie Sanders (I-Vermont), who made the 1930s reference, just click here (MP3-1:38)). Recall that on Friday, Washington Post writer Juliet Eilperin reported at the Post Carbon Blog that, “Sen. John D. Rockefeller (D-W.Va.) and several other coal-state Democrats sent a bluntly worded letter to Environment Protection Agency administrator Lisa P. Jackson Friday night challenging the agency’s authority to regulate greenhouse gases from power plants and other industrial sources. “The Rockefeller letter–which was also signed by Democratic senators Mark Begich (Alaska), Robert C. Byrd (W.Va.), Sherrod Brown (Ohio), Pat Casey (Pa.), Claire McCaskill (Mo. ), Carl Levin (Mich.), and Max Baucus (Mont. )–poses a serious challenge for the Obama administration. While the administration is still pushing for Congress to pass a climate bill this year, it has not ruled out controlling greenhouse gases through regulation. USDA chief economist Joe Glauber provided an updated economic outlook for agriculture yesterday at the Department’s Annual Outlook Forum in Arlington, Virginia. In part, Dr. Glauber noted that, “On February 11, USDA’s Economic Research Service (ERS) released its initial estimates of farm income and production expenses for 2010. 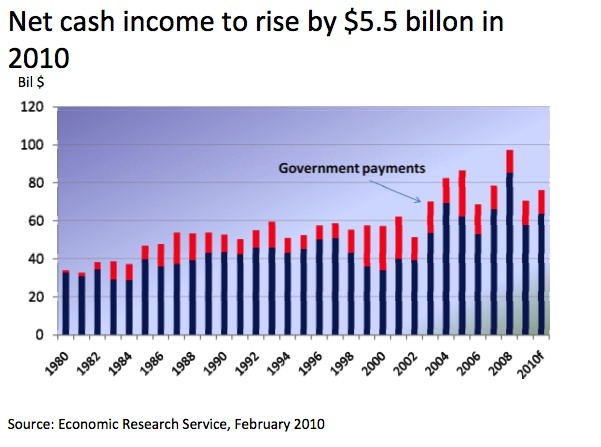 ERS forecasts net cash income at $76.3 billion, up $5.5 billion from 2009” [related graph from presentation]. 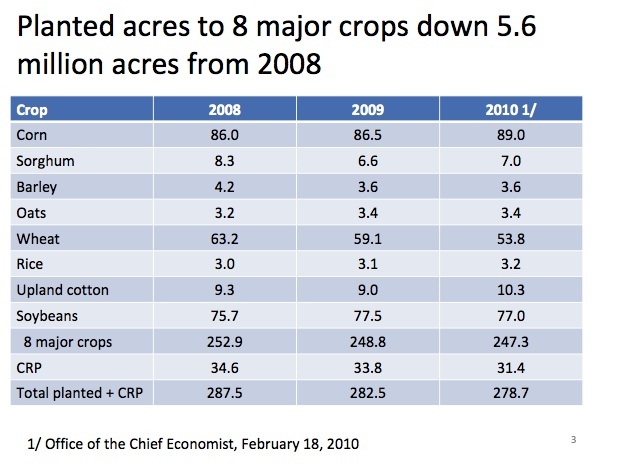 And with respect to crop prospects for 2010, Dr. Glauber stated that, “Less land is expected to be planted to the major field crops in 2010 as prices continue to ease from their record levels in 2008…Total planted area for the 8 major crops (wheat, corn, barley, oats, sorghum, soybeans, upland cotton, and rice) is expected to decline to 247.3 million acres, down 1.6 million from 2009. The 8-crop total is down 5.7 million acres from the recent high in 2008 as the net returns outlook is much less favorable than 2 years ago when prices were at or near record highs” [related graph from presentation]. “Though USDA had originally declined to detail the savings in the first proposal, the White House’s proposed budget detailed $8 billion in crop insurance savings over 10 years. Officials said Thursday the actual projection was closer to $8.4 billion. The proposed changes would still cut costs for crop insurance by about $6.7 billion over 10 years, based on percentages and numbers offered by USDA officials. Damon Darlin reported in yesterday’s New York Times that, “Industrial food production is not very fashionable right now. “Three books by Michael Pollan criticizing the system of giant corporate farms and food factories have topped the best-seller lists. A graphic documentary, ‘Food, Inc.,’ based in part on his books, has been nominated for an Academy Award. “Those who think blizzards and record snow falls in Washington will make it tough to move a global warming bill are guilty of ‘inside the beltway’ thinking, Kerry said. Alexander Bolton reported yesterday at The Hill Online that, “Record snowfall has buried Washington — and along with it, buried the chances of passing global warming legislation this year. “Cars are stranded in banks of snow along the streets of the federal capital, and in the corridors of Congress, climate legislation also has been put on ice. Jeanne Cummings reported yesterday at Politico that, “Defying conventional wisdom that a hardened partisan divide and looming midterm elections will prevent the type of compromises necessary for big reforms, business leaders and environmentalists are redoubling their efforts to advance an energy and climate bill in the Senate. Lisa Lerer and Manu Raju reported on Friday at Politico that, “Democrats are racing to hash out the details of a jobs bill by a self-imposed Monday deadline — and working overtime to gain the Republican votes they’ll need to pass it. “Democratic Sens. Chuck Schumer and Max Baucus spent Thursday in a flurry of delicate negotiations with Republican Sens. Chuck Grassley and Orrin Hatch , with aides going back and forth on the details of a tax-focused jobs bill. “The bill has shifted from a sweeping piece of legislation to a smaller, bipartisan bill — loaded up with tax cuts to gain Republican support,” the Politico article said. Lori Montgomery reported in today’s Washington Post that, “Congress agreed Thursday to revive the pay-as-you-go budget rules that helped wipe out massive deficits and balance the budget during the Clinton administration, although the new version includes a long list of exceptions that would permit Democrats to add at least $1.5 trillion to the nation’s tab over the next decade. “The House voted 233 to 187 to approve the rules, known in congressional shorthand as paygo. The rules were adopted last month by the Senate and now go to President Obama for his signature.